The history of Trinity College of Nursing & Health Sciences can be traced back to 1898 when the Moline Public School of Nursing opened its doors with four students; 1899 when St. Anthony's Hospital School of Nursing opened its doors with four students; and 1916 when the Lutheran Hospital and its School for Nurses opened its doors to serve students interested in the field of nursing. With medical advances made in the late 1930's these three hospitals and their respective schools of nursing continued to serve the residents of the Quad City area. In 1951, St. Anthony's opened the first radiography certificate program followed a year later by both Moline Public and Lutheran Hospitals. These early radiography programs consisted of 18-months of X-Ray Technology coursework at the hospital and a six-month internship leading to a certificate. In 1959, Lutheran Hospital started the school of inhalation therapy, which later became known as Respiratory Therapy and today is known as the field of Respiratory Care. In 1961, Moline Public Hospital began educating surgical technologists. This certificate program continued as a tradition until 2011 when the program was discontinued by Trinity College of Nursing & Health Sciences in an effort to move the College toward degree-granting programs. In 1972, Moline Public Hospital began educating Emergency Medical Services providers. This program offered certificates in Emergency Medical Technician-Basic and Paramedic. This program continued as a tradition until 2011 when the program was discontinued by Trinity College of Nursing & Health Sciences in an effort to move the College toward degree-granting programs. In 1989, Moline Public and Lutheran Hospitals merged to become United Medical Center, thus creating United Medical Center School of Nursing and United Medical Center Schools of Allied Health. On October 1, 1992, United Medical Center merged with Franciscan Hospital to become Trinity Medical Center, creating Trinity Medical Center School of Nursing and Trinity Medical Center Schools of Allied Health. Trinity School of Nursing transitioned from a diploma awarding program to a 2 + 2 program from 1994 - 1996. In 1996, Trinity School of Nursing applied for candidacy status with the Higher Learning Commission of the North Central Association of Colleges and Schools, seeking the authority to grant associate and baccalaureate degrees in nursing. This degree-granting authority, with five years of accreditation, was granted in 1998 and the nursing school assumed the name Trinity College of Nursing. From 2001 to 2002, Trinity Medical Center Schools of Allied Health transitioned the Radiography certificate program into an Associate of Applied Science program, thus eliminating the certificate option within this program. The Emergency Medical Services and Surgical Technology programs developed associate degree options while maintaining the option for students to obtain a certificate in these allied health fields. With the transition to degree-granting status within the allied health programs, Trinity Schools of Allied Health applied for candidacy status within the Higher Learning Commission of the North Central Association of Colleges and Schools. 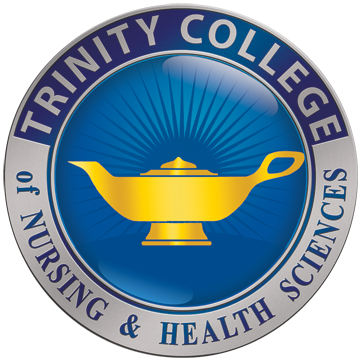 In 2003, the College was named Trinity College of Nursing & Health Sciences. Trinity College received degree-granting authority for an Associate of Applied Science degree in Respiratory Care in 2005. The first class was enrolled in this program in 2007. The nursing program was expanded in 2008 to include the first pre-licensure baccalaureate degree at Trinity College. The Bachelor of Science in Nursing - Accelerated program was designed for graduates holding a bachelor's degree in a field other than nursing. The Bachelor of Science in Nursing - Basic program was implemented in 2010. This pre-licensure nursing program offered an avenue for obtaining a baccalaureate degree for those who did not already hold a nursing license or a bachelor's degree in an unrelated field. Trinity College of Nursing & Health Sciences obtained approval to offer a Bachelor of Science in Health Sciences in June 2013. This program was designed for graduates of associate or certificate health sciences programs. The first cohort of Bachelor of Science in Health Sciences students was enrolled in the fall of 2013. Trinity College of Nursing & Health Sciences was approved to offer a Master of Science in Nursing program in June 2013. The first graduate program at Trinity College enrolled students in spring 2014. This program offers two options: Nursing Education and Leadership in Health Care Systems. Trinity College continues to develop nursing and health sciences programs to meet the health care needs of local and global citizens. When Trinity College of Nursing & Health Sciences affixes its seal to your diploma at graduation, you will know that you are fully prepared to complete the examinations required for your profession and to practice in your chosen health care area. The Seal is inscribed with a golden lamp, which signifies and radiates the light of knowledge. Upon graduation from Trinity College of Nursing & Health Sciences, you can claim lifelong affiliation with one of the finest nursing and health science colleges in the region.